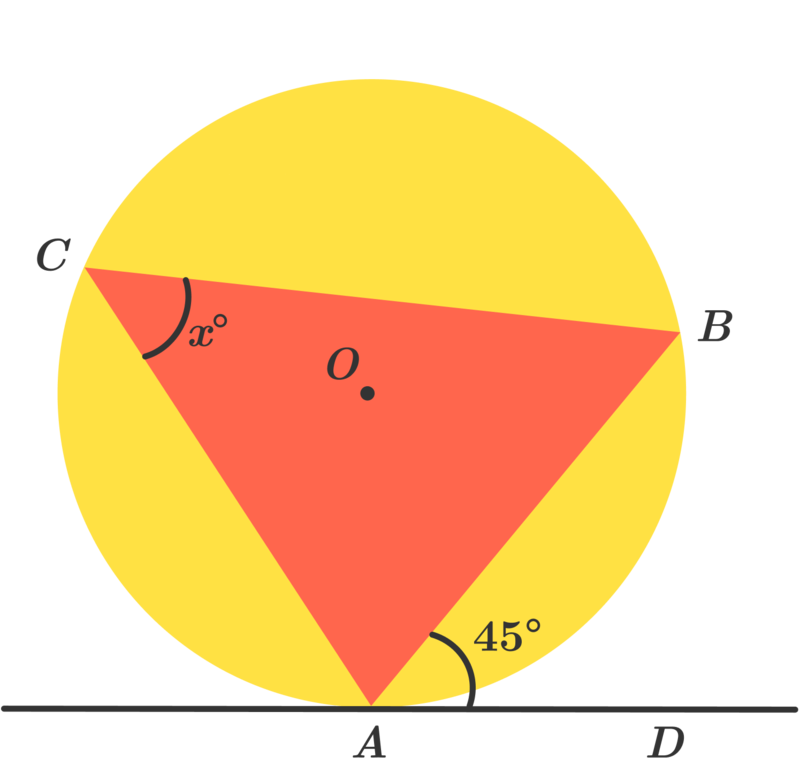 The alternate segment theorem (also known as the tangent-chord theorem) states that in any circle, the angle between a chord and a tangent through one of the end points of the chord is equal to the angle in the alternate segment. 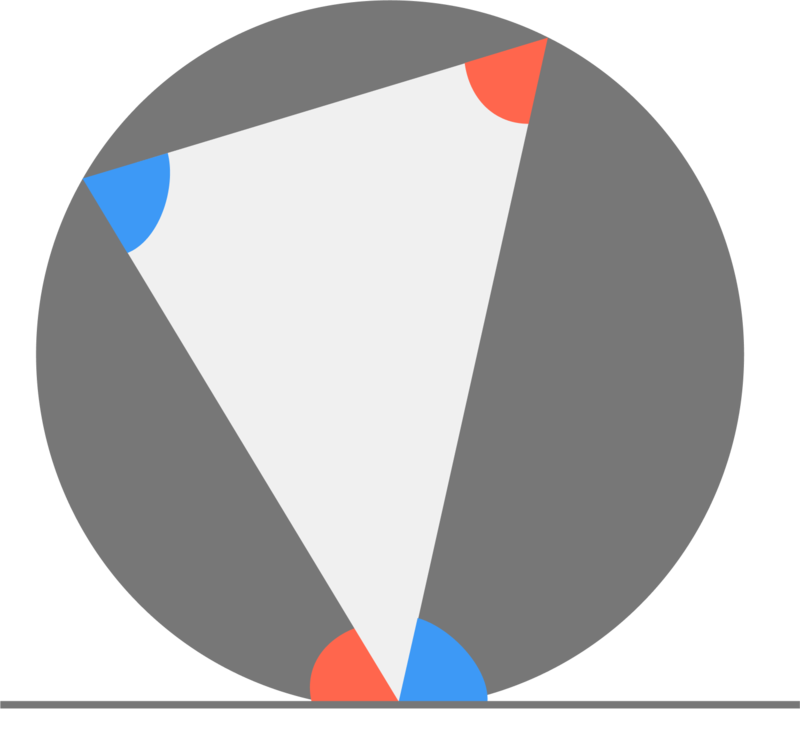 In the above diagram, the angles of the same color are equal to each other. 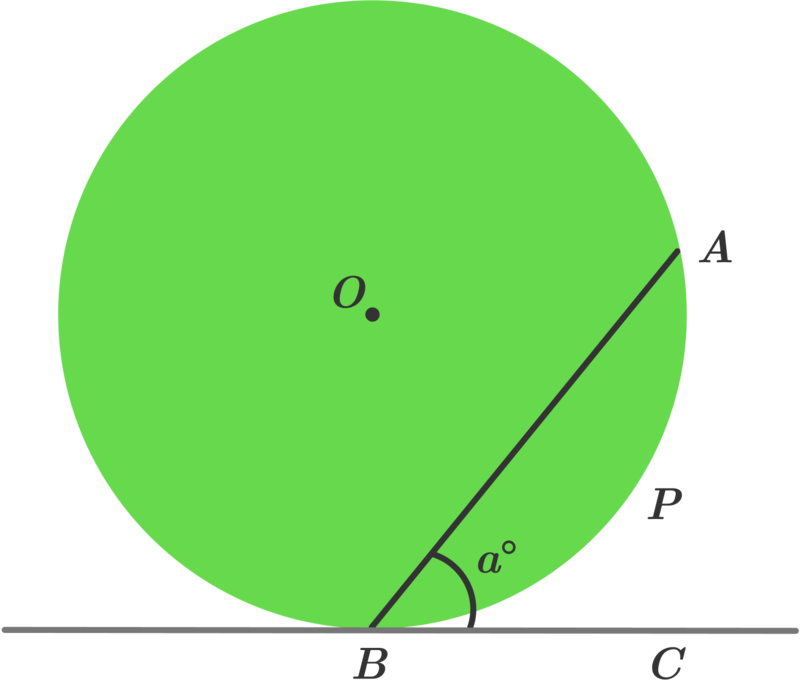 For easily spotting this property of a circle, look out for a triangle with one of its vertices resting on the point of contact of the tangent to the circle. In this wiki we will be learning this theorem in detail along with proofs and its applications in several arenas with the help of examples. Let's first get familiar with the definition of alternate segment theorem and then we will understand it by a detailed explanation. 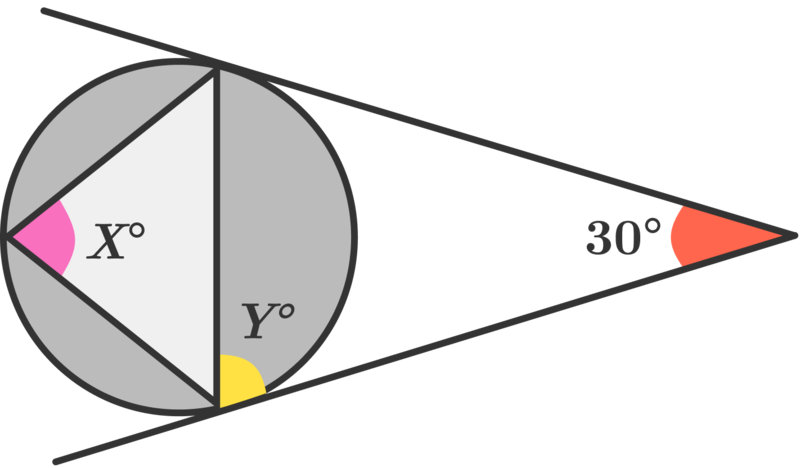 In any circle, the angle between a chord and a tangent through one of the endpoints of the chord is equal to the angle in the alternate segment, i.e. 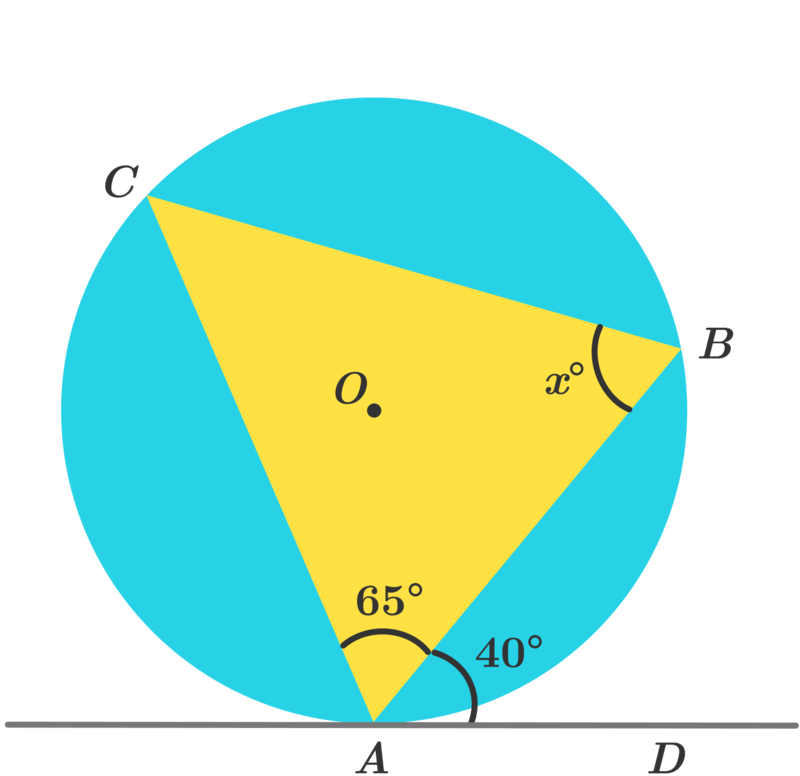 the angle subtended by the chord in the opposite side of the previous angle. 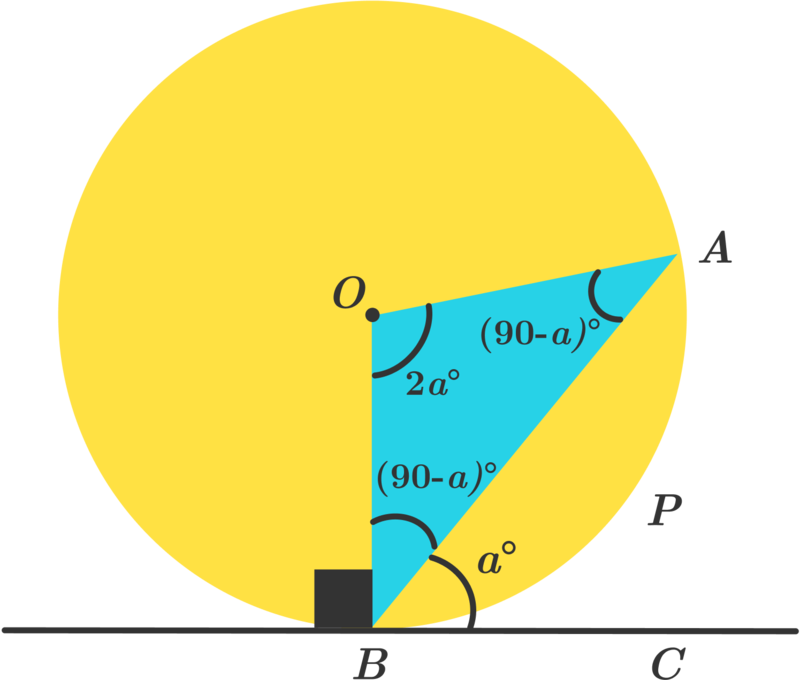 To be more explicit, consider the above circle \(\Gamma\) with center \(O\), with a chord \(PT\). 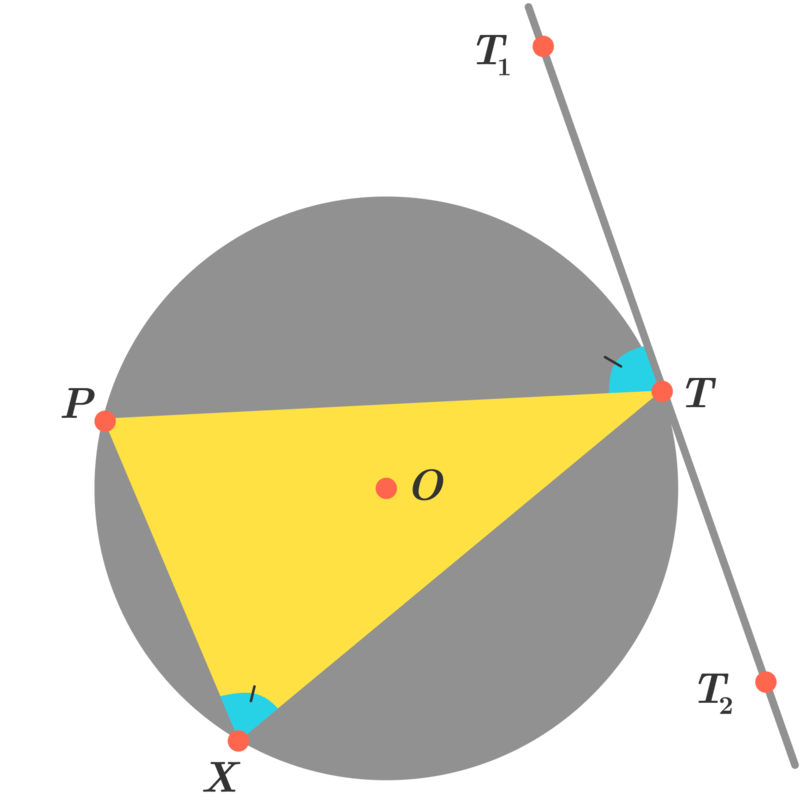 A tangent \(T_1T_2\) passes through the point \(T\). 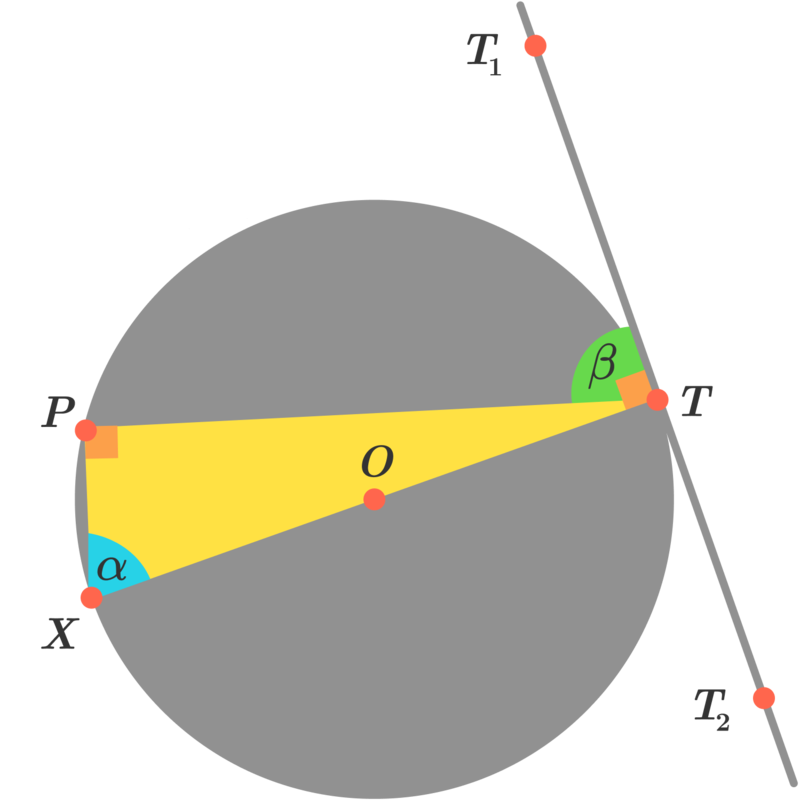 Consider any point \(X\) on \(\Gamma\) on the side of \(PT\) opposite to where \(T_1\) is situated. Then we have \(\angle PTT_1=\angle PXT\). For example, if \(\angle PTT_1=37^\circ\) then we have \(\angle PXT=37^\circ\). What if we arbitrarily move \(X\) on that side of \(PT\)? The statement still remains true because the angle \(\angle PXT\) subtended by minor arc \(PT\) is constant, irrespective of the position of \(X\). In this section we will prove the Alternate Segment Theorem through two different methods. Note: There is another configuration when the angle at \(X\) is subtended by the major arc \(PT\) (when \(\angle PXT\) is obtuse). This is left to the reader as an exercise. 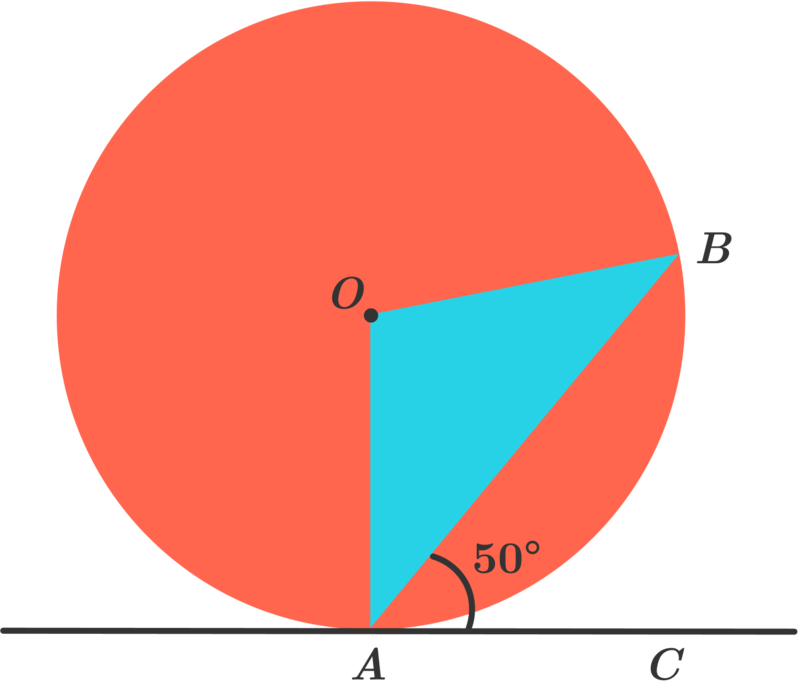 In the above diagram find the value of \( \angle AOB\), provided that \( \angle BAC \) is \(50^\circ\). 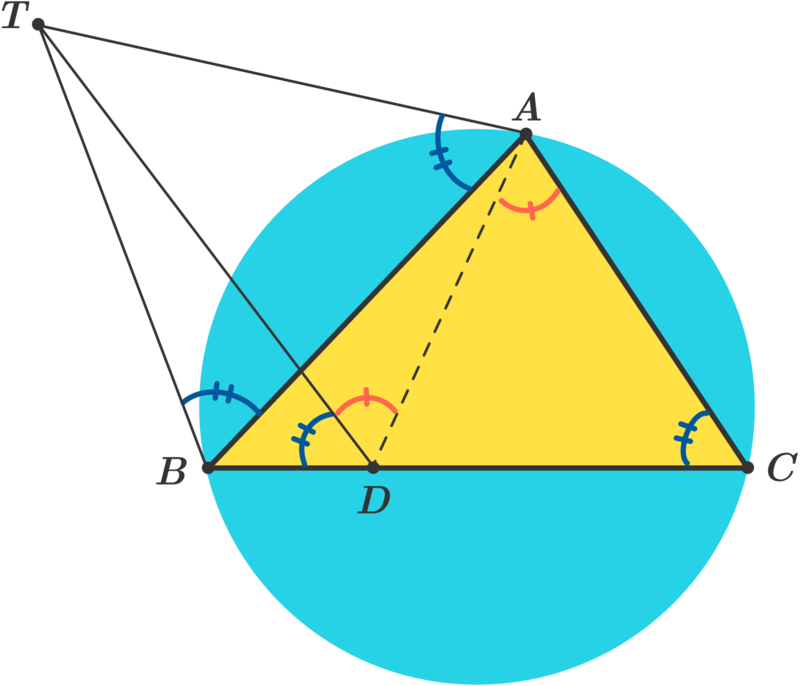 The tangents at \(A\), \(B\) to the circumcircle of \(\triangle ABC\) meet at \(T\). The line through \(T\) parallel to \(AC\) meets \(BC\) at \(D\). Prove that \(AD=CD\). 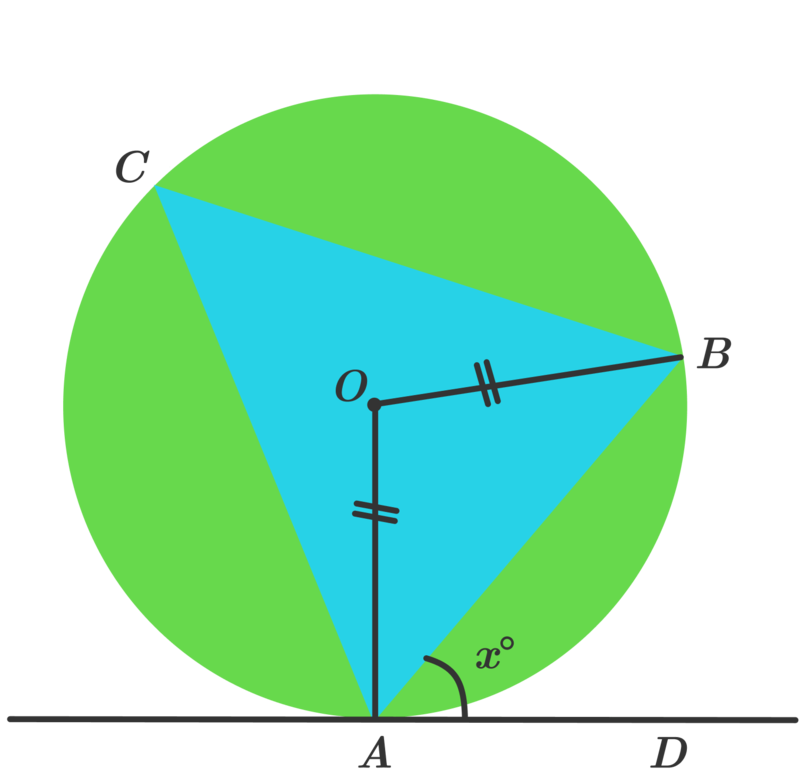 If \(\angle BAC = 78 ^\circ\)(in red) and \(\angle ODC = 74 ^\circ\)(in green), what is the measure of \(\angle BCA\) (in blue) in degrees? Circles \(\Gamma_1\) and \(\Gamma_2\) intersect at 2 distinct points \(A\) and \(B\). A line \(l\) through \(A\) intersects \(\Gamma_1\) and \(\Gamma_2\) at points \(C\) and \(D,\) respectively, such that \(C\) is not in \(\Gamma_2\) and \(D\) is not in \(\Gamma_1\). Point \(E\) is the intersection of the tangent to \(\Gamma_1\) at \(C\) and the tangent to \(\Gamma_2\) at \(D\). Learn more in our Outside the Box Geometry course, built by experts for you.